Online shopping is around for quit a long time, but it always was impersonal. Online retailers sell clothing not knowing us and never seen us! Nobody can honestly say: Dude, this is not your color. It is just you and the web-site. And once clicked on some item, you will be seeing it on your facebook as suggested promo FOREVER until you finally buy it. 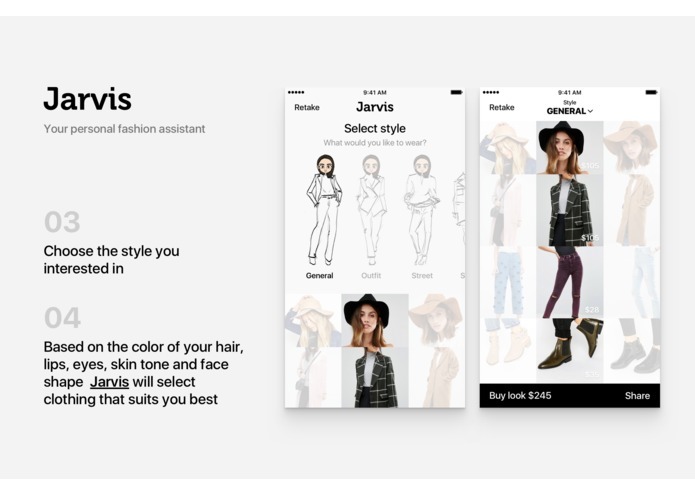 We created Jarvis - the smart assistant who can scientifically select clothing for online customers using neural networks. 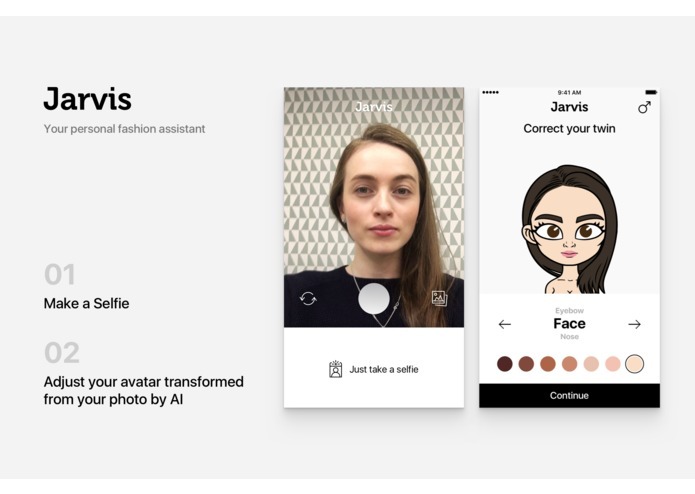 All you need is to make a selfie so AI could recognize your unique type of person. After that, Jarvis will create the avatar that looks like you - same hair color, skin tone, eyes colors. But you can also adjust it as well. 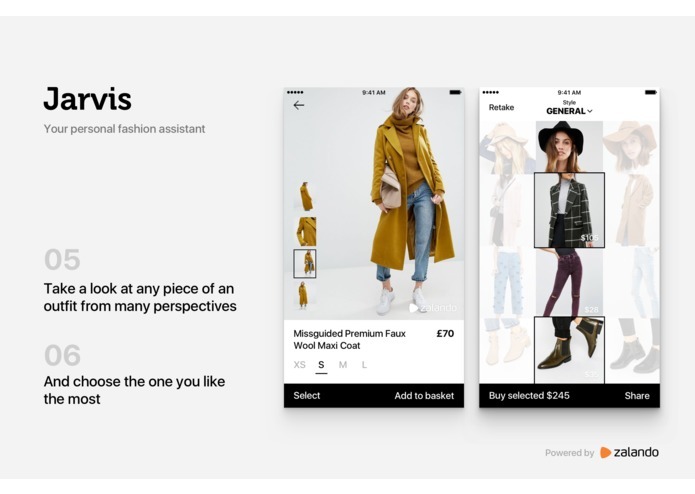 Then you can choose what type of style you are looking for and Jarvis will find items on online shops that can be well-combined and will be perfect on you. Jarvis makes a job as a professional stylist. Because he knows what colors are good or bad for any unique person. You can be sure that clothing you buy will be good on you. You click only on items you like and in the future, you also will like all targeting advertisement. 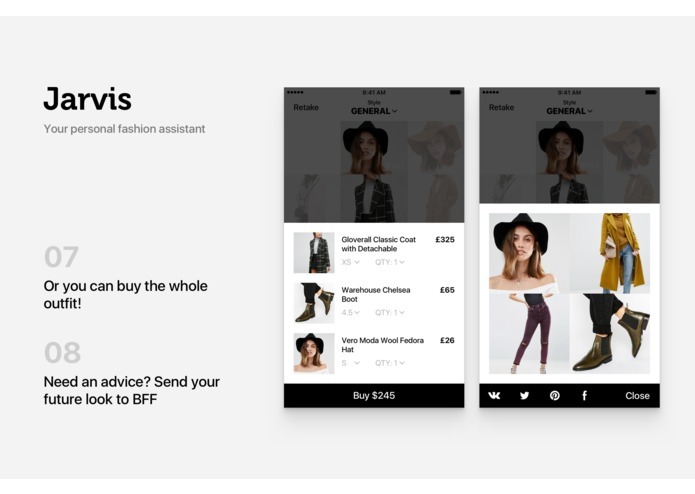 You will be confident when buying clothing, and retailers will be suggesting correct items and as a result selling more. Everybody happy and stylish. It is time for successful online shopping. How we did it. 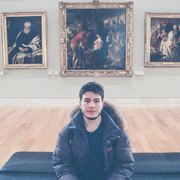 During the hackathon we labeled about 50 faces (each of them has about 20 photos) and prepared dataset. Using mxnet we trained relatively small convolution neural network to classify selfies. Also we used some OpenCV staff to fetch colors and improve results. Built backend for Jarvis. Trained 2 neural networks, which runs simultaneously, labeled 500pics Dataset during hackathon, and writed some html5 interfaces for the app.